Sheikh Muszaphar Shukor is the Malaysian astronauts who spent 11 days on the International Space Station in October 2007. He has been on a tour, giving presentations and promoting the idea of Muslims or people from the developing nations going to space. A few weeks ago, he was in Turkey as the guest of Turksat Corporation, and the high-circulation Hurriyet newspaper, published a short article based on an interview it conducted with him. Our friend Gary, who picked up the piece (thanks for the tip), was struck by the fact that most of it was devoted to how he prayed (in which direction, how frequently and at what times), whether he fasted (he fasted two days, he said, as his trip was during Ramadan), and that the scientific goals of the mission were, as Gary put it to me, “almost an afterthought at the end of the article.” (After all, Sheikh Muszaphar Shukor is an orthopedic surgeon, and he did conduct experiments on bacteria, cancerous cells, and protein crystals.) Even more striking was the following statement he made: “Everyone who goes to space feels a miracle. During my trip in space that took place in the holy month of Ramadan, I heard a ‘call to prayer’ in the Space Station…” No probing on this was done by the reporters. I was puzzled by this, not expecting it from Hurriyet, which is, after all a strongly secularist paper, I went to the web and searched for articles and videos on Sheikh Muszaphar Shukor’s space journey and his ‘call to prayer’ reference, which I was not sure I understood. After all, perhaps he meant that he had a cosmic/religious experience and was drawn (“called”) to prayer. First, no, the ‘call to prayer’ was stated in several interviews and articles, and indeed it was made quite explicit in a long piece in SingaporeScene, relayed by Yahoo News, in which he stated: “"During my time in space, I heard the azaan (Islamic call to prayer) and it was the most magical sound I've heard in my life." He did also refer to a cosmic/religious experience: "In space, you just feel closer to the Creator". In Turkey, he was also reported to have explained that he has become a better Muslim now, having felt that God had purposefully chosen him for that mission. The Malaysian astronaut has explained in several interviews that the purpose of his space trip, granted by Russia as a bonus for the purchase by Malaysia of a number of Sukhoi fighter jets, is in fact to encourage youngsters to pursue science and math careers. It is thus greatly disappointing to see so much focus (on the part of everyone) on what are in the end rather trivial issues (how many times and in which direction he prayed, etc.). Indeed, before his trip, Malaysia's space agency, Angkasa, organized a conference with no fewer than 150 Islamic scholars for the purpose of answering the religious questions (prayer time and direction, fasting, etc.). The result was a document titled “A Guideline of Performing Ibadah (worship) at the International Space Station (ISS)”, which was approved by Malaysia's National Fatwa Council. So much effort, when the Qur’an simply says “To Allah belong the east and the West: Whithersoever ye turn, there is the presence of Allah.” (2:115) And there are similar principles to allow every Muslim to solve such “problems” in unusual situations. But that requires a minimum of intelligent understanding of Islam and of personal decision-making, which the ulamas are often reluctant to grant to people. And so trivial issues become the core of the topic, and the exotic aspects eclipse the main goals. 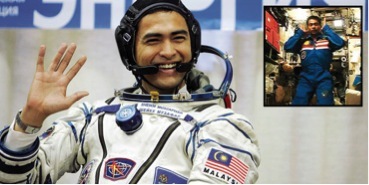 A “Muslim in Space” DVD has been made to chronicle the space journey of Sheikh Muszaphar Shukor. YouTube, on can find five clips of it (here): one is a 4.5- minute video about the whole trip (occasionally showing the astronaut doing some experients), one shows him praying in the space station, and another one shows him singing the chants of Eid, one has him playing with a bubble (in zero gravity) and uttering something about “surface tension”, one shows how he sleeps, and . Guess which one has the highest number of views?! While I have no doubt that the Malaysian had the right intentions and objectives for this space trip project, it is quite disconcerting to see it to a large extent wrongly considered and hence missing its main goals. Your post is a nice statement of the conundrum. A Muslim can be doing excellent, even cutting edge science and still more attention is paid to their faith than to the science they are doing. Considering that the Qur'an challenges its readers to think and analyse, Muslims engaging in science should not be a novelty and their religious practice should be secondary to reporting on the science. I think that a lot of attention was paid to the religious side of things in Malaysia to encourage Malay Muslim children to develop an interest in science. I suspect though that any encouragement would have come from Sheikh Muszaphar's personality. He almost has superstar status here. I believe that he may have been woken with a broadcast call to prayer which would be pretty inspiring in that location. I can remember sitting for the first time on the top floor of the Haram in Mecca enjoying a cool evening breeze when the azaan for Isha set my ears ringing. That was pretty inspiring too. It is interesting that he called it a miracle. Scientists I know who subscribe to no religion have described their reaction to new discoveries as like a "religious experience". This is something I totally understand. If I had to wait for a miracle for inspiration I would not have an interest in science. I find that in the exquisite beauty of fossils and the questions and answers and the stories that can be drawn out of studying them. More than that the things I discover on that journey and the detours that often result keep the sense of wonder alive. Sadly I suspect the really interesting story of Sheikh Muzaffar's journey is yet to be told. That is the story of the science he engaged in on the trip and the planning and consultation with his colleagues that took place beforehand and the nature of the team effort that it took to get him there. a) It is true that people were more interested in when and how he prayed, etc., than in the scientific and higher goals of his space trip, but he seems to encourage it himself. And that's the unfortunate part. One can't really blame the general public, or even the reporters, but the man himself (a doctor) should steer things into the right directions. c) Sheikh Muzaffar does indeed, through his personality and even his looks, turn his lectures into rock-star appearances (one can find countless pics of him with teenagers and young adults), but I don't know if that's good or bad for the cause. "But that requires a minimum of intelligent understanding of Islam and of personal decision-making, which the ulamas are often reluctant to grant to people." Anyone can become an alim, it isn't some elite secret society. Just go to school, learn, pass the courses. The education is so much cheaper than a secular one too. 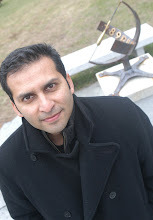 Many people pursue courses of study through both secular and religious institutions. There's no excuse. Study up or relinquish your right to have your opinions on a subject taken seriously. A Muslim need not go to any Ashram (or Special Retreat) for meditation if he or she knows how to perform Salât.